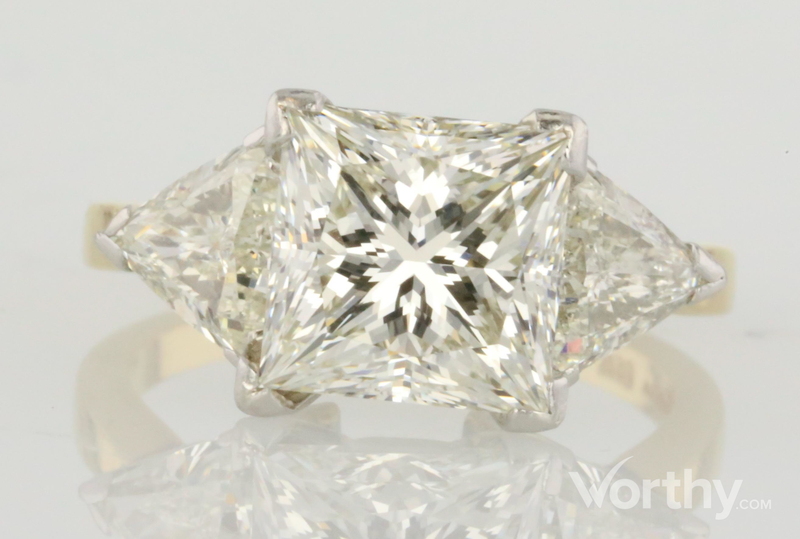 other custom made 3 stone ring consisting of princess shape, natural diamond, weighing 4.54 carats, having a K color and VS1 clarity, according to GIA grading scale. The center stone measuring 8.65mm x 8.71mm x 7.08mm. All surrounding diamonds are genuine with a total carat weight (cttw) of 1.52 carats. Chip Description: Very small chip near the feather in the pavilion corner. Inclusion Description: The grade making inclusion is a bruise-like feather located in the pavilion near the corner. This appears to have occurred after setting. There are several pinpoints located in the pavilion outside the table. There is also a natural in the pavilion opposite the corner with the feather. Blemishes Description: There is slight abrasion over the corner facet junctions that were covered by the prongs. It appears the diamond was not secured properly in the mounting causing this and the feather mentioned above. Heads are made of platinum and shank is 18KY. We have removed the stone from the mounting so we have the actual weight. The condition of the mounting is the reason that the diamond has sustained damage and now has a lower clarity grade than it originally had when set (and certified previously as VVS1).